Hitting the zeitgeist is what making mainstream motorcars is all about, because, as Iain Robertson suggests, it is a market sector that is not really about aspiration, or high performance, but is about reality and making ends meet. Reading between the headlines that made the news in 2014, away from the innumerable tragedies and moral injustices that took place, many of which shocked, amazed and disturbed us, a cursory ‘life goes on’ attitude was all pervasive. It is what decent, upstanding and honest people do. We tolerate, we rail against, we make our statements of disgust but we do not stand still. We move on, because, to do otherwise, would be to reside in the yesteryear, a medieval past that is neither satisfying, nor satisfactory. Believe the ‘news’ and you would never believe that our politicians and bankers had learned their lessons about a need for honesty and tact. Believe the news and you would never believe that superficiality still retained a place in our society. Believe the news and you might believe that the motor industry, the UK political and financial barometer, was riding the crest of a wave. While it is true that new vehicle registrations have sky-rocketed, you ought to ask a more telling question about how many of them are manufacturer instigated and, simultaneously, contemplate the ‘smoke and mirrors’ marketing foolhardiness that accompanies it. Working on a principle that the ‘rich are getting richer’, especially under ‘GlamCam’s’ gaze, I suppose it is understandable that the so-called ‘premium brands’, which are more truthfully today’s mainstreamers, should be establishing new registration records. Yet, at the other end of the market are the realists. While some of the ‘pretenders’ (Kia/Hyundai, Seat/Skoda) have been making waves, so have their price tags, which seem to have escalated without interruption for the past five years (and largely without complaint, which only serves to justify the unjustifiable). Among those realists is Vauxhall. When Ford throws a bone, it is usually snaffled up by Vauxhall. However, something happened towards the tail-end of 2014. Vauxhall became braver. Somewhere within the company, a fresh spark of vitality had developed. Unsatisfied with just following its nemesis, Vauxhall started to plough its own furrows. The task had commenced with its popular Astra line-up but was developed by a process of Kaizen-like improvements to its Insignia range. Yet, the clear evidence of its forward intentions was placed on the welcome mat to its all-new Corsa line-up. What is more important is that Vauxhall cannot afford simply to plate its way to success. It needs to sell each and every model. Vauxhall had grown a pair! I recall arriving in mostly cynical mood at the launch venue, the PriestHouse Hotel, Castle Donington, late last year. When you have heard the multitude of platitudes being uttered by carmaker staffs, from initial salutation, through the inevitable press conference and carefully staged dining arrangements, all prior to clapping eyes on the ‘new product’, such an attitude is equally inevitable. However, all of it was thrown to the wind upon driving the new Corsa. In fact, Vauxhall could have been significantly more enthusiastic about its newcomer, as every word, each inflection, all expressions and every implication were so judiciously underplayed that my fast-growing impression was of ground-shattering potential….”the new Corsa is better than the latest Fiesta…by a country-mile!”. My end of year declaration (which you will find in the final paragraphs of the Suzuki Swift 4×4 feature, if you can be bothered to click it out) was that the Vauxhall Corsa is an easily justified Small Car of the Year. It certainly was in 115bhp 1.0-litre form but I was keen to sample the 89bhp, lower cost variant, partly to check the viability and validity of my pronouncement, but mostly to underscore my beliefs. Tested in SRi trim, always a major attraction to both the important company car, as well as private acquisition customers, Vauxhall is playing an ‘ace card’. You see, rewarding populist appeal is a vital element of mass market propagation. Is Vauxhall being clever? No. It is simply being aware. Unlike Ford, which would serve up a loaded ace, with accompanying heftier price tag, Vauxhall is making a less aggrandising opportunity available. Ford plays its ‘Mars Bar’ edge by trying to move buyers into a higher debt zone. It places its most popular (and no less excellent) product alongside the cash register in the hope that you will buy into it but that you will also want the markedly better trim detailing and equipment list of its ‘box o’ chocs’ up-market variants. That is why a modestly loaded Fiesta can cost upwards of £20k. Yikes! Investing less gets you what you pay for and it is not very much. The Corsa 1.0SRi is powered by the same three-cylinder, turbocharged, transversely-mounted motor that makes such a significant impression in the 115bhp version, although this ECU-managed lower-power variant will create as much of an, if not a greater, attraction to a large segment of the demanding small hatchback scene. In three-door form, it might not offer the accessibility required by ‘yummy-mummies’ but it does afford much easier entrance and egress to a two metres tall tester, so I am grateful. However, the three-door shape is arguably more stylish than the five-door, a factor that supports its sportingly-implied SRi badging. Its meagre 89bhp is supported by 170Nm of torque, or pulling potency, which ensures that this Corsa is not left behind in the traffic-lights GP. In fact, in its default ‘ECO’ setting (a dashboard button, which, once depressed, cuts-out the stop-start technology), the new Corsa is surprisingly lively at lower engine speeds. The psychology of the engine cutting out at full stops, while effective, is slightly lost, thanks to the exemplary refinement of the triple, which can be scarcely heard, unless you floor the throttle and extend the rev-range, which is not entirely unmelodic. While hardly a hot rod, the Corsa hikes up its skirts and heads for the horizon in the most cheery and willing manner. Slicing through the six forward gears (a major advantage over the five-speeders normally motivating cars in this class) is as accurate and easy as a surgeon dealing with a ‘snip’ operation, albeit with a zero post-operative pain prognosis. Timed loosely on the open road, I managed to breach the 0-60mph sprint in around 11 seconds. The car will course onwards to around 112mph top whack, in the right (and legal) circumstances. However, when it plays the Joker, an average fuel consumption of 55.8mpg, attained in a week-long mix of city, country and motorway driving, without trying to be frugal, is a significant bonus. That its VED is zero, is helped by the borderline 100g/km CO2 emissions figure. 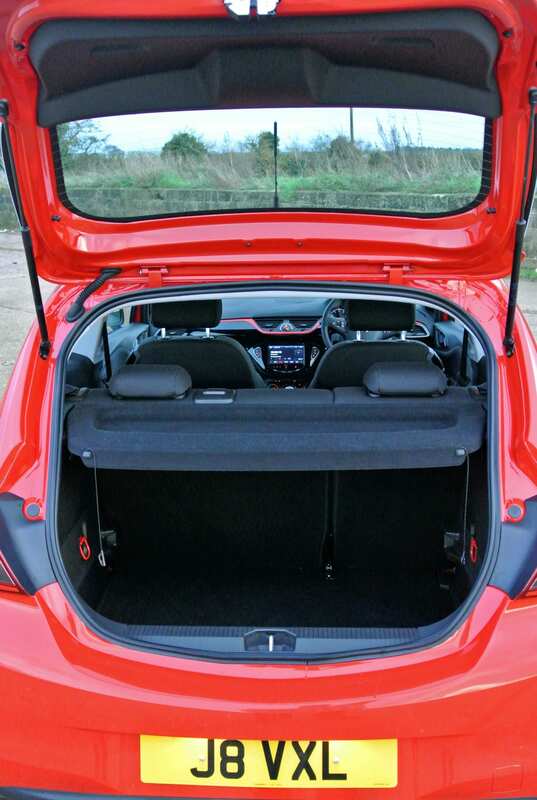 However, where the new Corsa SRi wins is in its unbeatable standard specification. Although I am not a fan of heated windscreens, as the teensy embedded wires tend to vibrate and upset the eye, most especially at night-time in moist conditions, I cannot fault the speed with which an electrically heated windscreen can be defrosted/demisted. Live with it, as it is standard. The ‘IntelliLink’ mobilephone connection, which provides sat-nav (if you have the ‘app’) is equally faultless and eminently practical technology, not least as the Bluetooth works so efficiently. The sporty front seats are exceptionally comfortable and supportive, while the red trim appliqué across the width of the dashboard is smart and not overpowering. Rain sensitive wipers and automatic headlamp illumination are bonuses and even the hide-wrapped steering wheel, with audio controls, is comfortable. The black 16-inch diameter alloy wheels add a sporty touch, while the hill-start assist is very useful. Air-con keeps occupants at the right temperature, while the selectable on-board computer read-out between the two main instrument dials is very practical, front fogs are fitted, as is cruise control and a 60-40 split rear bench seat. There is a lot more to contemplate but no Ford, no Kia, no Skoda is as well equipped without adding several thousands of Pounds to the bottom-line of the invoice. Priced at a wholly realistic £13,425, the new Corsa customer can enjoy a package of truly high value, at a low ticket, full in the knowledge that solid residuals at trade-in time will keep PCP payments at sensible levels too. 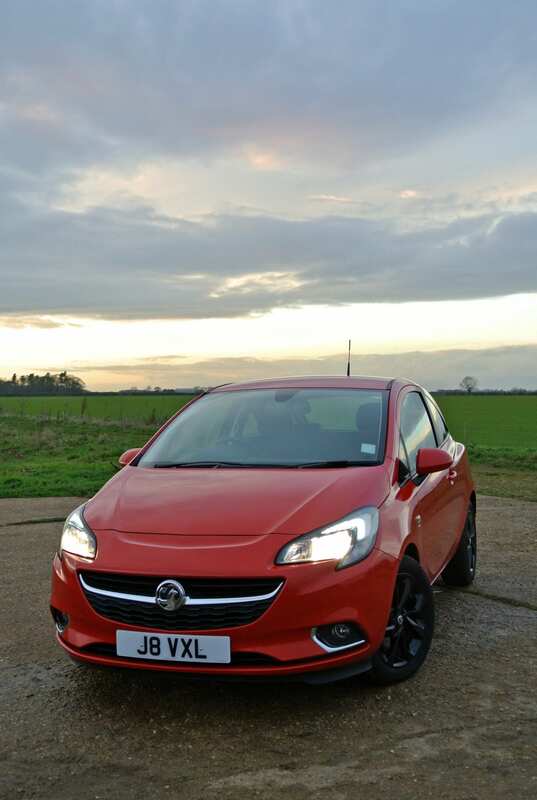 In fact, on that score, the Corsa also maintains its ‘giant-killer’ progress. Conclusions: Do I like it? You had better believe it. This is the first Vauxhall, for many years, that I would covet personally. It meets and exceeds so many consumer parameters. The car looks good, if derivative, is smartly detailed and impeccably well-equipped. However, factor in its exquisite handling balance, superb grip levels, positive steering and braking efforts and the new high value, realistically-priced Corsa becomes ‘the car you always promised yourself’, if Ford will allow me to steal its much-vaunted tagline.